The single most important thing in disc golf course design is safety. It doesn’t matter how great the one par 4 is or how sweet that final hole is. If your course is a hazard to those who play it or those who are in the park, your course isn’t something to be proud of. Over time, thousands of people will play your disc golf course and it’s your responsibility to direct disc golfers and lead them in a safe and fun way. It’s typically not just a backyard course that you and your friends will play. It’s for everyone of all skill levels. You want to set up everyone for success. This means the disc golfer, the public, the neighbors, the park district, and park-goers. We are professionals in safe course design and we’ll help you. 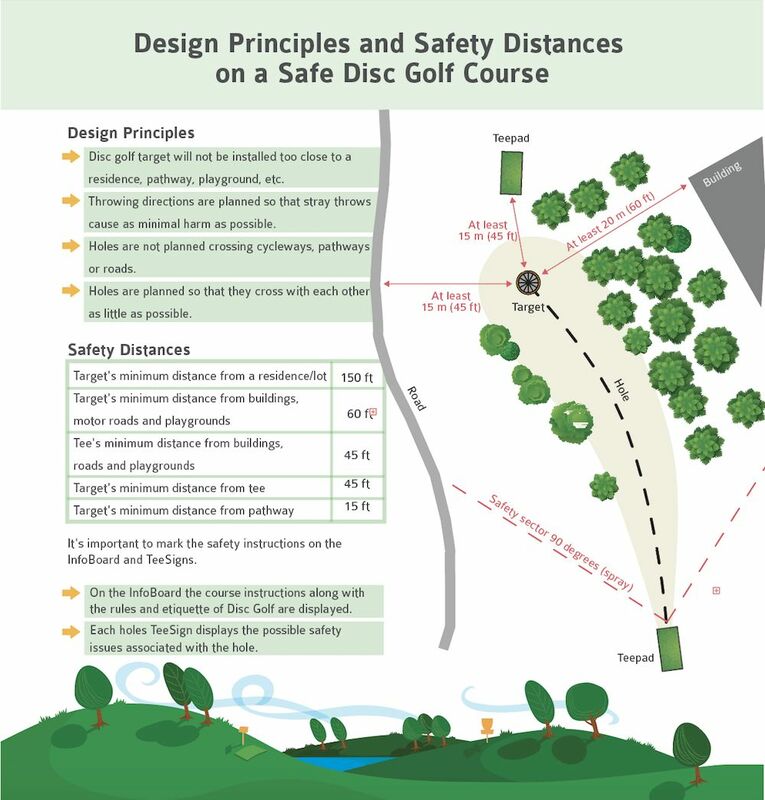 Some of DiscGolfPark® design principles and safety distances. If you can make a disc golf course that is not just a great course, but safe for everyone, you have a winner. Remember, it’s easy to talk about the bad holes or the unsafe holes. All it takes is one incident to ruin all the fun and games. Always think safety first. Of all the hundreds of projects we have done, we have declined more than a dozen because we have considered the area unsafe for a disc golf course. It’s better safe than sorry. We train all of our designers before they become DiscGolfPark course designers. We go through course design principles and safety issues. If you have our DiscGolfPark binder introducing the concept, you’ll find the following page about design principles and safety distances on a safe disc golf course in it. It is important to not only walk the course before and during the design phase, but also after the plans are finalized. This should be done before installation of any holes to ensure proper safety. You might have designed the hole to be played in a few ways, but odds are, it won’t always be played that way. We’ll look at what happens when a disc gets released too early or too late. Is it going to come into conflict with any other areas of the park? What are common wind directions for the park, or a specific hole? We need to take that into account to predict what types of discs one might throw on that hole. We design for worst case scenarios. 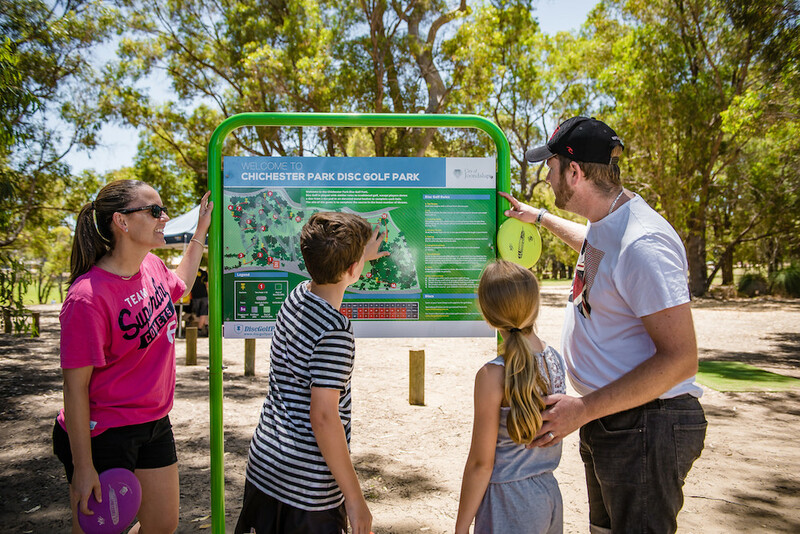 On courses that include common areas or walking paths, we need to respect all park-goers and make sure that a disc golf course doesn’t ruin the entire park. When it’s designed the right way, everyone will enjoy it! If you select DiscGolfPark, you can count on getting a safe design. You can ask for an offer here and see our designers here.